Sunday's weather was good enough for us to go for a little drive up toward Pyramid Lake in a direction we rarely go. At Nixon, we turned along the west shore of the lake and drove as far as Sutcliffe, where we stopped to example an artifact of the town's day's as a railroad stop. Sutcliffe was once a station on the Fernley & Lassen Railroad, a Southern Pacific branch that ran from Fernley through Wadsworth, up the west side of Pyramid Lake, crossing the Western Pacific at Flannigan, then running along the north side of Honey Lake to Susanville and on to Westwood to tap the lumber resources of the area. 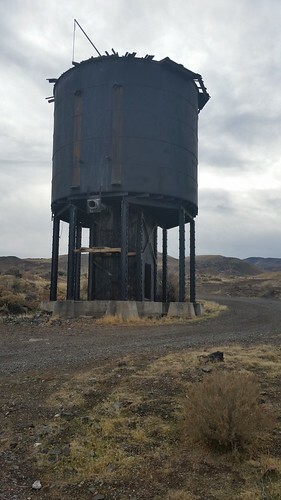 This appears to be the steam era water tank. 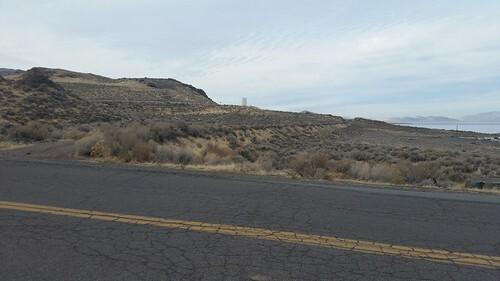 Looking north from the site of the tank, you can see the right of way stretching away below the level of the highway. This section was abandoned in the 1960s in favor of trackage rights over the WP from Flannigan. The paved road ends north of Sutcliffe, so we turned back south and went to Sparks over the Pyramid Highway, did some minor grocery shopping (because WinCo was packed out, so we'll go back later when it's less crowded), and went home. Not hugely exciting, but it got us out of the house for a while and the weather was good.